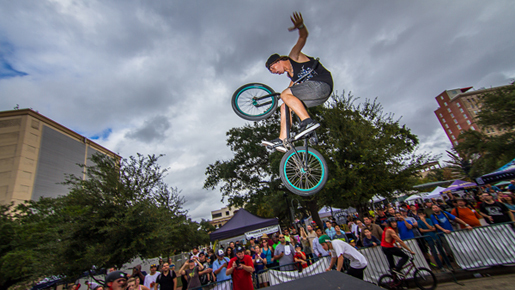 This year's HTX Bike Fest will feature Pro and Am street comps with a $500+ cash purse for Pro. The 6700 sq/ft riding area will house a very unique and clean street course. Please register online in advance to help us prepare for what we hope will be one of the best contests in Texas this year. To register in advance to ride the bmx park or compete in the sides event contests, please fill out the form below. To PAY ONLINE, click on the Paypal button in the right sidebar. CLICK HERE TO FILL OUT DIGITAL WAIVER. HELMETS ARE REQUIRED TO RIDE THE RAMPS AND COMPETE IN THE RAMP COURSE.